Hayes Anderson has never thought about leaving the Magnolia League or Savannah. She's led a charmed life, where almost every problem can be fixed up with a spell or conjure from the Buzzards, a family who are experts in hoodoo. But when secrets start to spill, and things start to become dangerous, Hayes suddenly finds herself questioning the life she's always known and finding unexpected answers. 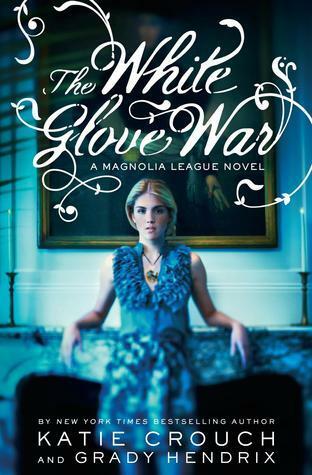 I was very glad to have The White Glove War right on hand as I finished its predecessor, The Magnolia League. I can’t have imagined a better way to go into it, as all the details from the first book were still fresh in my mind. While I was initially worried that it would become a sophomore slump, I actually ended up liking it even more than The Magnolia League. The setting, of course, was the main thing that drew me to this book - and I’m happy to say that we find out even more about it. There’s more about where the Buzzards live, for instance, and more about the houses of Hayes and Alex, and even more about Savannah in general. Though the descriptions weren’t necessarily completely vivid, I did think that I got a pretty good idea of what things looked like. While magic was certainly a big part of the first book, it definitely came into its own in The White Glove War. There was seriously so much more going on with this hoodoo business, and I found everything utterly fascinating and never confusing. It’s definitely interesting to ponder on what it means to have all this magic that can give you wealth, beauty, power, even love at your disposal. It was a treat to learn more about the magic, and to see how it could be both a helpful and a harmful tool in the lives of the Magnolias. Speaking of the Magnolias, the relationships became even more intense in this one. There’s definite tension between lots of different parties - Alex and her grandmother, Hayes and her grandmother and mother, Alex and Hayes, Alex’s grandmother and Hayes’ grandmother and the Magnolias and the Buzzards. All this tension certainly made for some explosive and emotional moments, and I felt like a gleeful (if slightly ashamed) observer as I watched things implode. It makes me glad to be able to report that, by the end of the book, things are sort of resolved to my liking - with a twist I was not expecting. There’s definitely a whole lot more happening in this book. Secrets are unraveled, relationships are viewed with a lens of honesty, dark magic is messed around with, the romance starts to become the real deal... It’s a lot for one book to take on. The White Glove War, however, is successful in bringing it all together in a story that had my attention from page one up until the end. I sincerely hope there’s a third installment in this series, even if it is the final one. Though things definitely ended in a satisfying way, I can’t shake the feeling that there is definitely more that could happen to all these characters I’ve grown fond of. The White Glove War brings even more of that Southern charm, with a twisty story, an exploration of the characters and their relationships and a whole lot of hoodoo magic. I haven't read much about book one and this is the first review I've seen of book two, but I am definitely intrigued now! I read part of this review not realizing it is a sequel but this sounds like a really interesting series. I haven't read these books and I've seen very little talk of them online, but I see them constantly at work. The covers looked interesting, but I never bothered to read them or even find out what the series was about. I've been intrigued by this series, but haven't picked it up. After reading this review, I might need to give book #1 a try! I hadn't heard of this series but I put it straight on my wish list as it sounds like just my thing. Thanks Alexa!